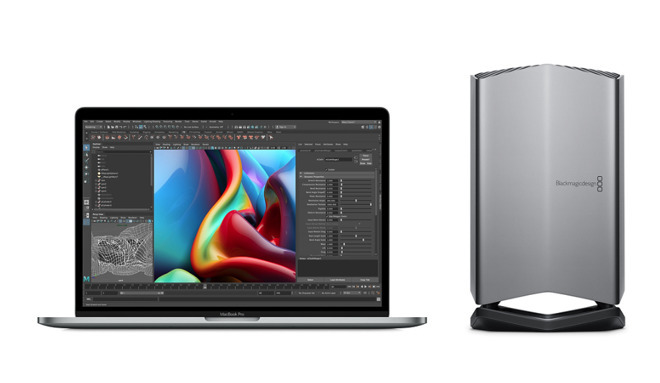 Apple has launched a new version of its eGPU enclosure that it developed with Blackmagicdesign to boost the graphical processing of Thunderbolt 3-equipped Macs, with the Blackmagic eGPU Pro boasting a new Radeon RX Vega 56 graphics card. Appearing in the online Apple store, the Blackmagic eGPU Pro features the Radeon RX Vega 56 with 8 gigabytes of HBM2 memory. Using an all-in-one aluminum enclosure similar to the previous generation, the eGPU is able to accelerate games and graphics-intensive professional applications, with Apple suggesting it could also be used to enable virtual reality experiences. Primarily connecting to its host Mac using Thunderbolt 3, the unit includes two Thunderbolt 3 ports in total, four USB 3 ports, one HDMI 2.0 port, and a DisplayPort 1.4 connection. The unit is also capable of 85 watts of power delivery, allowing it to recharge a connected MacBook Pro while providing extra graphical performance. The unit weighs 9.92 pounds overall, and measures 6.96 inches wide and long, and 11.59 inches high. It is supplied with a 1.64-foot Thunderbolt 3 cable, as well as a power cable. Shipping in late November, the Blackmagic eGPU Pro will cost $1,199. The original Blackmagic eGPU is still available in the online Apple Store, equipped with a Radeon Pro 580 GPU and priced at $699.